St. Luke’s Outreach is where we extend ourselves into the community and the world. We are called by God and our faith practice to reach into the world and serve those in need. At St. Luke’s we take this call seriously in our joyful work. Our most obvious ministries are Toni’s Kitchen and the Second Time Around Shop. Toni’s Kitchen serves hot lunches on Thursday, Friday and Saturday, and dinner on Sunday, every week of the year. 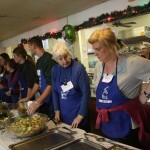 The mission is simple, “Serve our guests.” The amazing volunteers at Toni’s Kitchen live this mission in many ways. The Second Time Around Shop redefines the idea of a thrift store. In addition to selling gently used items when the shop is open on Wednesday, Thursday and Saturday, the shop makes donations to individuals and groups in need. The shop also offers grants of nearly $20,000 each year to other charities. Twice a month an additional “AIM red basket” collection is taken on Sunday and every penny of these donations is given away to outside ministries that serve the world as part of our Action in Ministry. Other fundraising and awareness raising efforts include our participation in Relay for Life to help fight cancer, the CROP Walk to help fight Hunger and the Rosanne Morey Christ Child Project. 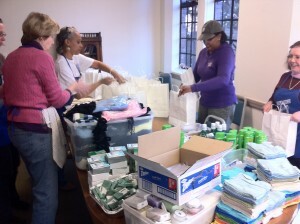 St. Luke’s continues to be an incubator for new ministries. We are currently exploring our involvment in a local community organizing effort and have begun a ministry of Patient Advocacy serving those struggling with understanding hospitalization and other complex medical issues. We use our buildings to support our world in the world also. Four different 12-Step program meetings (AA and Al-Anon) are held at St. Luke’s each week. We also house the North Jersey Information Service for Al-Anon/Alateen, as well as their Literature Distribution Center, Montclair Learning Center and Imani which reach out into our local schools and Job Seekers, a local group working to help people achieve re-employment. Click on picture to contact Anne Mernin, Director of Outreach.